As the freelance evolution gains a foot, there are more and more people who are extended the opportunity to work from home. While this may mean the absence of rigid corporate rules and a time-consuming commute, it’s not all pleasure-filled days and PJ’s. Working from home requires discipline in the way you approach your work, your health, your education, and your overall well-being. Without the structure of a 'normal' working day, and the uncertainty that can come from working for yourself, looking after yourself physically and mentally is of huge importance, particularly as you adapt to your new routine. Here are some of the ways you can go about it. Meditating, expressing gratitude, and reflecting on the day ahead. Spending quality time and connecting with your spouse. Spending some time on a passion project or hobbies like hiking or reading. Catching up on the appropriate news and social media for a limited portion of time. Starting the morning right means getting enough sleep the night before, and so it's important to implement cut-off times when it comes to your work. If you've sat in bed all night answering emails, that early alarm is always going to be brutal. Working freelance affords you flexibility, you can work your job around your life- rather than the other way around. But structure is still good, and having a routine ensures you're working and sleeping at the right times. It is very easy to be distracted when you work from home, either getting completely engrossed in your work and neglecting the household duties, or procrastinating with miscellaneous tasks because you don’t feel like working. Remember, your time is the only thing you can never get back, so be sure to invest it wisely. There are various timekeeping productivity hacks to help you achieve this, such as the implementing the Pomodoro Technique - which divides your time into 25-minute work intervals with 5-minute breaks. On the fourth ‘Pomodoro’ you take a 30 minute break to refresh. If you want to bump up the productivity even further, keep ahead of the housework during your longer breaks by preparing dinner, washing the dishes, or making a brain-boosting smoothie. Sites like Mommy Authority are worth a read as they give advice about time management and organisation, all incredibly useful for the work-from-home freelancer. Many people can find that traditional workplaces can lead to unhealthy habits. In offices for example there are often cakes and biscuits passed around, and most workplaces arrange drinks and dinners with colleagues. Admittedly, there is a social side you miss here, but you also get to stay in control of your nutrition more too. Plus, when you work from home you have the freedom to implement more interesting health-conscious habits into your day, so you might as well make the most of it! Sit on a yoga ball instead of your desk chair to promote core strength and balance. Keep your yoga mat close and do a few relaxing poses. Eat bright and healthy meals, with nutritious snacks. Take a long and enjoyable lunchtime to eat mindfully and without distraction. Oil pull after lunch, detoxing your mouth and body. Take part in juice cleanses or fasting to give your body extra benefits. Swap out excess cups of coffee for soothing ginger tea. Play calming music such as Tibetan singing bowls. Light incense or a scented candle if things start to get stressful. Make and apply a rejuvenating homemade face mask. Do yourself a favour and be sure to schedule outside time to get away from the home-work space. Go walk barefoot in the garden, visit a local park, have a lunchtime picnic, hug a tree, or just lie in sun. This will not only have great benefits for your physical health - such as lowered blood pressure - but improve your mental health with regards to mood, memory, and stress. Working from home is the dream for some, but for others it can feel extremely lonely and isolating. If you already struggle with mental health issues, it could even make things worse. Have a chat with your doctor or consider speaking to an online therapist if you begin to struggle. It's not to say that you'll need to give up your venture, but they will be able to give you qualified advice for managing your condition and looking after yourself while you work from home. Working from home means that the line between personal and professional time is often blurred. Don’t forget that there is more to who you are than your profession, such as your spiritual growth and educational development. Dedicate time each day to learn something new in an area of interest, meditate or take part in a spiritual practice, or develop a skill such as coding; being sure to mark it on the calendar and try not break the chain. By investing in yourself, you will naturally become more optimistic with less anxiety and stress. You could even develop a passion that could become your day job. 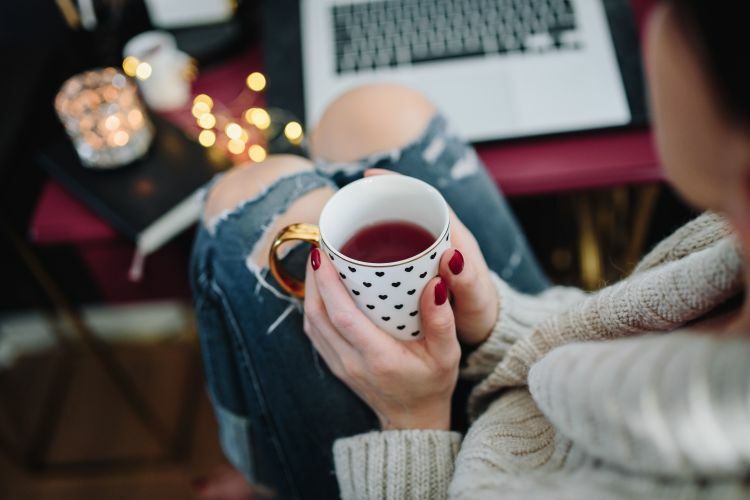 From kickstarting the morning in a productive way to keeping track of your valuable time; implementing fun healthy habits, exploring the outside world, and investing in yourself - these five ways will be sure to promote your wellness when working from home!